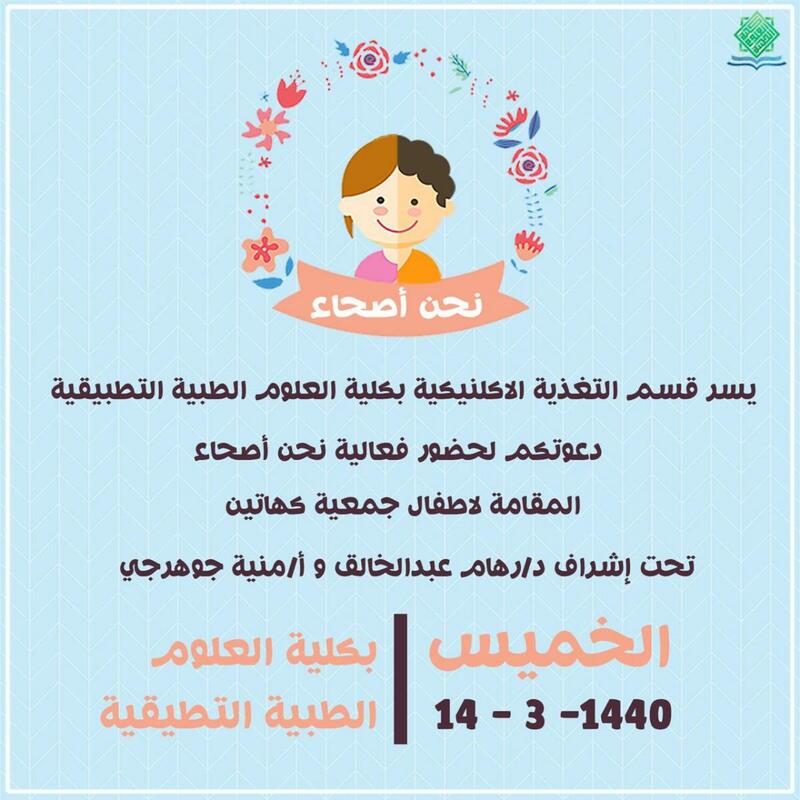 The Department of Clinical Nutrition at the College of Applied Medical Sciences is pleased to invite you to attend an event entitled 'We Are Healthy', which will be held for the children of Kahatayn (Like these Two [Fingers]) Society on Thurday, 14 Rabi` Al-Awwal, 1440 A.H. It was narrated on the authority of Sahl bin Sa`d (may Allah be pleased with him) that the Messenger of Allah (peace be upon him) said, "The one who takes care of an orphan will be with me in Paradise like these two." He then pressed his middle finger and forefinger together. Therefore, we seek to provide scientific nutritional knowledge for orphaned children and teach them the basics of nutrition by means of play and fun according to their age and level of thinking. Definition of healthy nutrition and the importance of nutrients. Introducing the importance of sports activities and linking them to popular kinetic sports. Evaluating the children's nutritional status by measuring their weight and height. Providing different activities, including drawing, coloring, and competitions. Distributing gifts and a variety of fruits to encourage them to eat healthy foods. Drawings and colored pencils for the children to color in pictures of healthy foods. Clay to make shapes of some foods. Plastics samples of some foods and fruits, which the children will be asked to classify into healthy and unhealthy foods in a competition.